Where are humans in the food chain? Bonhommeau et al. address this question in PNAS, apparently for the first time, in detail across all countries and over the period from 1961 that FAO statistics on food consumption and production are available (FAOstat.FAO.org). If we ate only the primary producers – plants – we would have a trophic level of 2. Much of China and indeed the rest of Asia, the lightest colours on the map above, is not far from this vegan trophic level of food consumption. If we ate only products of vegetarian animals (cow milk, or rabbit meat for example), our trophic level would be 3. Apex predators such as polar bears or whales that eat other carnivorous animals have a tropic level of 5.5. 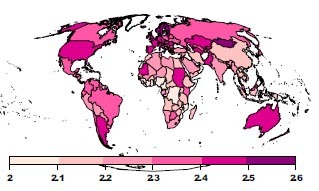 For the human population of different countries, the highest is Iceland, but many of the other countries in the dark colour of the picture above are similar with a trophic level of 2.5, meaning a diet of half plants and half (vegetarian) animal origin. In fact, the human diet includes few non-vegetarian animals – veal calf and some fish (farmed which are fed on fishmeal and wild such as mackerel) are obvious exceptions. The PNAS paper also considers temporal changes. The increase in animal consumption in China and India is evident: the trophic level increasing from 2.05 to 2.20 in the last half-century. Iceland, in contrast, has declined from the exceptionally high 2.76 to 2.57. Sylvain Bonhommeau, Laurent Dubroca, Olivier Le Pape, Julien Barde, David M. Kaplan, Emmanuel Chassot, and Anne-Elise Nieblas 2013. Eating up the world’s food web and the human trophic level PNAS 2013 : 1305827110v1-201305827. Trophic levels are critical for synthesizing species’ diets, depicting energy pathways, understanding food web dynamics and ecosystem functioning, and monitoring ecosystem health. Specifically, trophic levels describe the position of species in a food web, from primary producers to apex predators (range, 1–5). Small differences in trophic level can reflect large differences in diet. Although trophic levels are among the most basic information collected for animals in ecosystems, a human trophic level (HTL) has never been defined. Here, we find a global HTL of 2.21, i.e., the trophic level of anchoveta. This value has increased with time, consistent with the global trend toward diets higher in meat. National HTLs ranging between 2.04 and 2.57 reflect a broad diversity of diet, although cluster analysis of countries with similar dietary trends reveals only five major groups. We find significant links between socio-economic and environmental indicators and global dietary trends. We demonstrate that the HTL is a synthetic index to monitor human diets and provides a baseline to compare diets between countries. Here we combine ecological theory, demography, and socioeconomics to calculate the human trophic level (HTL) and position humans in the context of the food web. Trophic levels are a measure of diet composition and are a basic metric in ecology, but have never been calculated for humans. In the global food web, we discover that humans are similar to anchovy or pigs and cannot be considered apex predators. In addition, we show that, although countries have diverse diets, there are just five major groups of countries with similar dietary trends. We find significant links between HTL and important World Bank development indicators, giving insights into the relationship between socio-economic, environmental, and health conditions and changing dietary patterns. This entry was posted in Environment, Farming, Literature, Sustainability and tagged animals, aquaculture, breeding, carnivorous, crops, culture, diet, farming, FISH, food, food security, vegan, vegetarian. Bookmark the permalink.